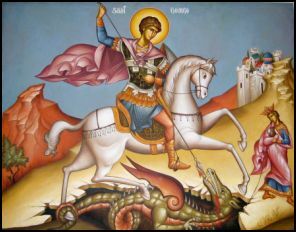 On April 23rd we commemorate Saint George. He was a soldier in the Roman army & is venerated as a Christian martyr. On 24 Feb AD 303, Emperor Diocletian issued an edict that every Christian army soldier be arrested and every other soldier offers a sacrifice to the Roman gods. St. George objected, and claimed to the Emperor himself a Christian. Diocletian attempted to convert George by offering land, money and slaves if he made a sacrifice to the Roman gods, but George never accepted. Therefore Emperor had him tortured and executed. Before the execution George gave his wealth to the poor. 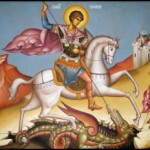 He is immortalized as Saint George and the Dragon and is one of the Fourteen Holy Helpers and prominent military saint. In iconography he is depicted as a slaying a dragon (representing Satan) with often the image of the young maiden (wife of Diocletian, Alexandra) looking on from a distance.